Tilachi ladoo recipe - Wishing you all a Very Happy and Prosperous Makar Sankranti and Pongal. 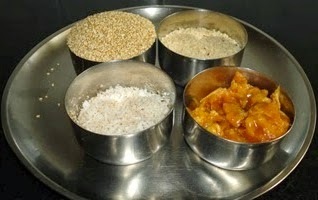 Today on the auspicious day of Makar Sankaranti and Pongal, I am posting tilachi ladu recipe. 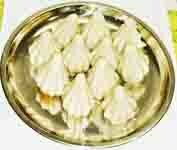 Tilachi Ladu is one of the favorite traditional sweets prepared during Makar Sankranti festival. What I like most in this ladu is its crunch and softness. These two in one texture is what made this ladu unique and different from all other ladoos. This ladu is prepared with few ingredients and among them sesame seed is the basic one. Ground nut powder and coconut turns this ladu soft, whereas sesame seeds make it crunchy. 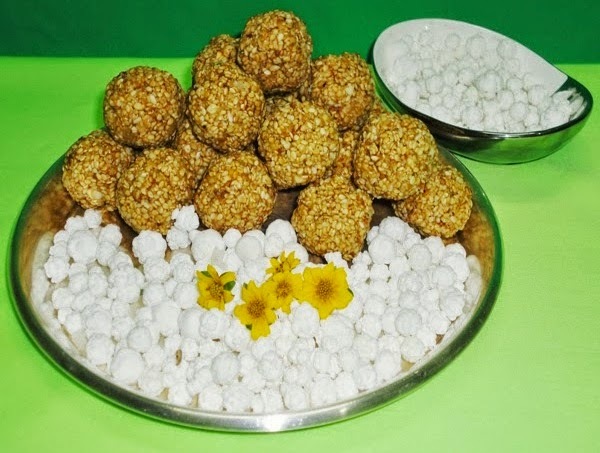 During sankranti sweet prepared out of sesame and jaggery or sugar such as tilachi vadi, tilachi ladu and tilgul are distributed among friends and relatives. In Maharashtra, puran poli and ground nut poli are also popular on this festival. Roast the sesame seeds in a pan till all the seeds crackle nicely. Transfer to a plate and allow it to cool. Roast the ground nuts for 3-4 minutes and remove from the pan and allow to cool. Once the ground nut cools, remove the husks and grind into a coarse powder. Dry roast the grated fresh coconut till aromatic and keep aside to cool. Now mix together the roasted sesame seeds, ground nut coarse powder and roasted coconut. Heat a pan and add jaggery to it. When the jaggery melts, add the sesame seeds, groundnut powder and roasted coconut and stir continuously till the mixture dries up and become a lump. Once the mixture turns to lump, remove from the flame and add cardamom powder to it. Mix and keep it aside. When the mixture becomes warm, make small sized laddus from it. When the laddus comes to normal temperature, store them in an airtight container. Tilachi ladoo can be stored for about 15 days. When the mixture becomes cold, it becomes very solid and you can't make ladu from it. Then warm up the mixture keeping it on low flame and make ladu. Do not store the warm ladus in an airtight container. Let it comes to room temperature. Wonderfully shaped tillseed balls.Good one.Yummy. fantastic til ladoo :) looks very tempting ! !